Setting up user alerts is critical to fully take advantage of a propane tank monitoring system. Tank Utility’s Operations Portal provides the ability to set up alerts either individually, monitor by monitor; or globally for the full portfolio of devices. 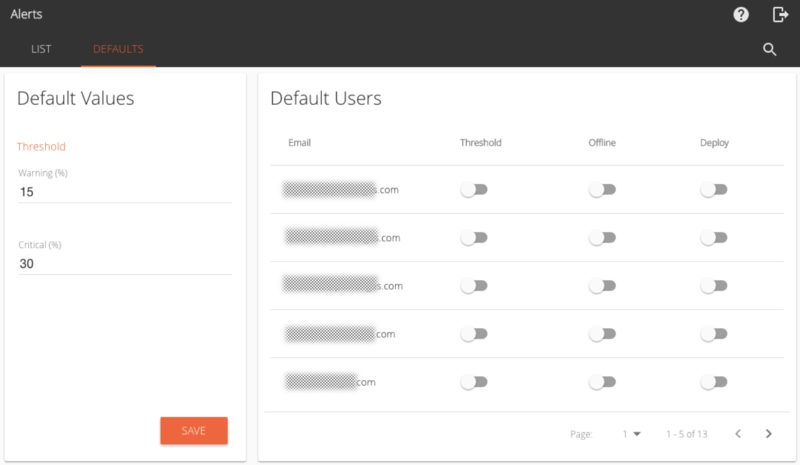 At the portfolio level, operators can set up alerts and assign users ahead of deploying all monitors. Portfolio alerts include warnings for offline devices, deployments, and tank level threshold alerts. In the Operations Portal screenshot below, users can configure those 3 options. Default alerts for tank level threshold are a warning at 30% and a critical alert at 15% on portfolio alerting (as shown in the screenshot above). This threshold alert is only set after a monitoring device has been deployed. For already deployed devices, users should configure bulk alerting (that is to say this feature does not work retroactively). Also important to note is that only the users selected prior to an individual device’s deployment will be associated with the alert. The device offline alert sends an email every 24 hours with a summary of offline devices (this notification typically occurs around 5 am EST). A tank monitor that is offline is any device that has not sent a reading in 48 hours. This alert can be helpful to troubleshoot devices is changes have occurred with the monitor’s setup or environment.